Microcosm Publishing is local company that is an excellent resource for self-publishers and independent written word. Love that! Find the original post here. In an ongoing effort to tell the world about the great places that valiantly stock Microcosm’s work, this week we’re highlighting Portland’s own Brown Bear Herbs, an herbal apothecary in NE PDX. 1. What’s the story of Brown Bear Herbs? What makes you most excited to get up every morning and do what you do? addictions by the same means that binds them. This is transformation! I love hearing success stories from people who have quit smoking using my herbal cigarettes. Breaking free of addiction and dependence on greedy corporations is super empowering. It makes me smile to see it happen. 2. 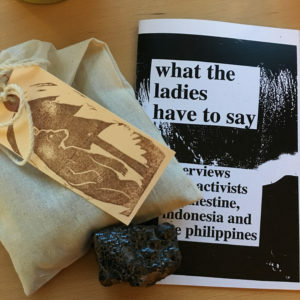 Thanks for selling the books and zines we publish and distribute! What are your favorite ones that you get from us? We have really been enjoying the School of Life Designs–but also like to have on hand political zines and books to help people get out and make a difference. 3. What’s your favorite thing you have in the shop right now? A trio of support/empowerment: Our Blood and Boundaries herbal bath, a chunk of raw hematite to ground intense energy and “What the Ladies Have to Say” to read while you’re in the bath. 4. Based on your interactions with customers in the last couple months, what’s your prediction for our political/cultural future? Or what would you like to see happen? I am inspired by the level of outrage and activism I see. I’d love to see a increasing surge in loud, voices and sharing personal stories. Everyone’s voice matters and everyone deserves respect and human rights. I want to see the realization that we (the collective minorities and undervalued and those who believe in human rights for all) are actually the majority and we will get what we demand. 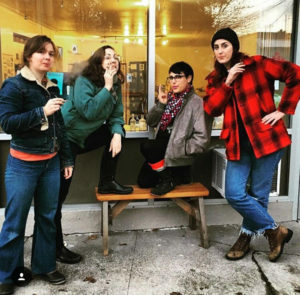 Check out Arati’s shop online at BrownBearHerbs.com and in the real world at 309 NE Wygant Street, PDX, or follow them on instagram: @brownbearherbs or on Facebook.